In 2013, the world’s cities accounted for 64 percent of primary energy use and 70 percent of CO2 emissions. Energy use in buildings is the second largest contributor (after transport) to urban GHG emissions and to urban heat islands. Emissions reductions programs for buildings, then, could bring deep decarbonization to cities and other benefits to boot, like lower energy costs. Zero-carbon buildings – or equivalent terms like “net-zero energy” and “zero-emissions” buildings – are highly energy-efficient buildings that, through building design strategies and energy efficiency measures, reduce overall energy demand. Many incorporate on-site renewable energy systems or buy renewable energy generated outside the building’s boundaries to meet the balance of its energy needs. For a country like India that is working not only to reduce pollution but massively improve energy access too in both rural and urban areas, zero-carbon buildings take on further value, as there is a tremendous amount of new construction coming online and every kilowatt hour not used in one place can be used elsewhere. India’s building sector will account for 55 percent of electricity demand by 2047. Mitigation in this sector should become an immediate priority in order to avoid the lock-in effect of inefficient building stock and help increase the reliability and affordability of energy supply generally. 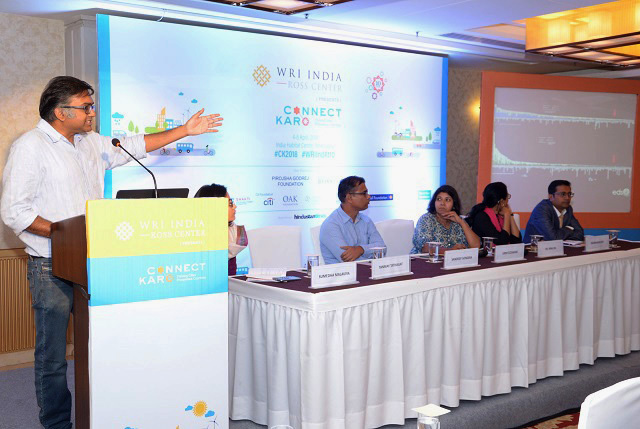 At Connect Karo 2018, an annual urban planning, design and research conclave by WRI India, WRI Ross Center staff convened a panel discussion on the framing of zero-carbon buildings in the country, current barriers and feasible aspirations. The team will be working with one Indian city over the next year to develop a roadmap for zero-carbon buildings, giving the event special import. Recent years have seen some pilots of “net-zero energy” buildings in India. However, net-zero energy buildings have not seen rapid scaling-up since achieving net zero for all buildings is not possible due to space, resource and regulatory constraints. Since zero-carbon building principles allow for buying renewable energy from sources outside the building’s boundaries, it is a classification that is more universally applicable. But most zero-carbon building definitions do not account for embodied energy or carbon. Since 60 percent of the building stock expected in India by 2050 has yet to be built, some panelists advocated for a life-cycle approach to measuring carbon, one that considers offsetting energy used in production of building construction materials too. While most roadmaps globally have prioritized conversion of new or existing building stock of a certain building type to zero carbon, Indian practitioners argued for strategies that go beyond ‘’building scale’’ to achieving a zero-carbon balance for neighborhoods, districts or even cities. Panelists agreed that India doesn’t lack the technology or the knowledge expertise to go zero carbon, instead most saw regulatory and financial barriers as the biggest challenges. India has taken some steps in the direction of decarbonizing the building sector through the latest version of the Energy Conservation Building Code, which mandates a small amount of on-site renewable energy generation for new construction and renovations of large buildings (100 kilowatt or larger connected load). However, previous versions of the code have seen limited application. Implementation requires the coordination of multiple government agencies resulting in delayed and patchy enforcement. Developers have been less inclined to support the code due to higher initial transaction and construction costs. Improving the speed of approvals and providing financial support to builders for lowering the costs of construction could make a big difference. Achieving zero-carbon buildings in India’s different climatic zones will require localized standards. A panelist representing a developer from sunny Pune described “nearly zero-carbon” approaches applied to the developer’s residential projects like using low-carbon materials and on-site solar photovoltaic generation. Panelists recommended a zero-carbon building roadmap for large, fast-growing cities like Delhi, Ahmedabad and Pune first, where the large amount of construction and better capacity to implement policy could lead to fast results. Practitioners also called for more pilots and research to explore differences in building types and to find ways to account for the large cooling demand in Indian cities. Zero-carbon buildings offer climate mitigation benefits by drastically reducing emissions from energy use and help to manage urban heat islands through interventions like green and cool roofs. They also offer direct economic benefits in the form of reduced energy requirements, improved energy productivity and enhanced energy security. And they offer important co-benefits, like improving energy access to the underserved and better air quality inside and outside. Over the next couple of months, the WRI India energy team will work with one city to establish the scope, definition and boundaries of zero-carbon buildings. This will be followed by prioritizing suitable building types, collecting data on building stock and its energy performance, and consulting stakeholders to model different zero-carbon building pathways and identify enabling mechanisms. The team will also engage with other cities to ensure replicability and adoption of this vision beyond the initial pilot city. Indian cities will be ground zero for implementation of decarbonization actions and buildings should be at the core of this transition. Sumedha Malaviya is a senior project associate with WRI India’s Energy Program.